Colorado ski towns are small dots on the map that carry a huge scenic punch. But when you think of ski towns, you think of slicing turns in epic powder during the winter time. 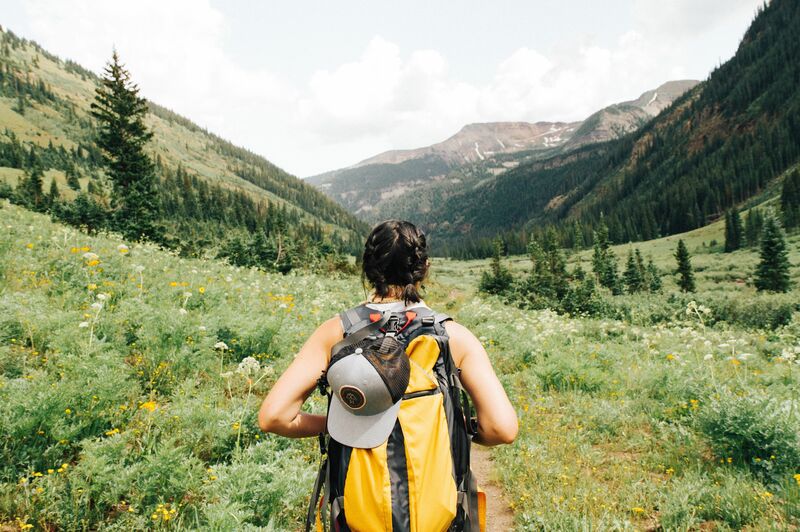 Here are 7 summer and fall specific hikes and mountain passes that will have you craving the thin air and small town vibes of CO ski towns before winter kicks in. This 30-mile, well-maintained dirt road winds through aspen groves, reminiscent of Fern Gully. The craggy peaks of East and West Beckwith stand out through the lush patches of green as you emerge from the forest. This are may be home to one of the largest organisms on earth. The aspen grove that spans the length of Kebler Pass, located in the West Elk Mountains, shares a single root system and is therefore a single organism. In the fall, this area really puts on its crown, as the aspen are colored from ochre to ruby and every shade in between. Piney Lake is a stunner, sitting at 9,000 feet and surrounded by incredible vistas of the Gore Range. It’s an excellent option for those wanting an adventure you can drive to. The lake is about 12 miles outside of Vail with 45 minutes spent on a well-maintained dirt road, suitable for 2-wheel drive vehicles. 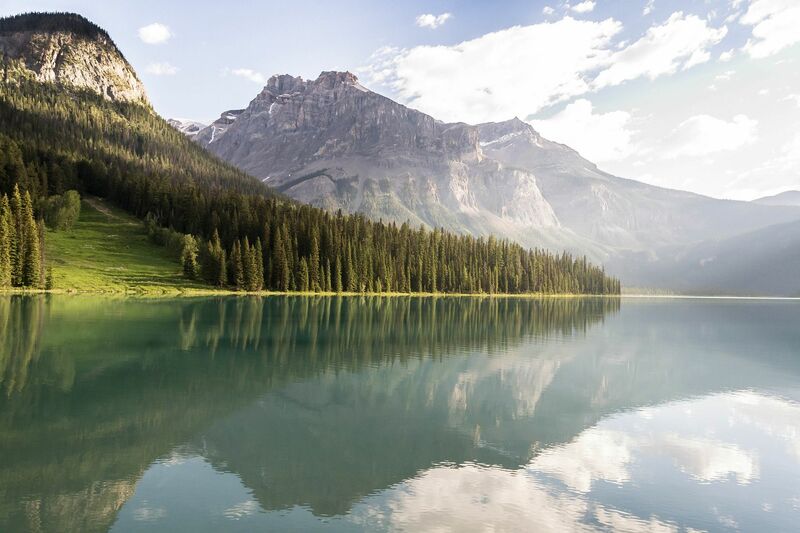 Upon arrival, you can hike the lake, fish (catch and release only, with permit), and have your camera ready for the occasional moose. 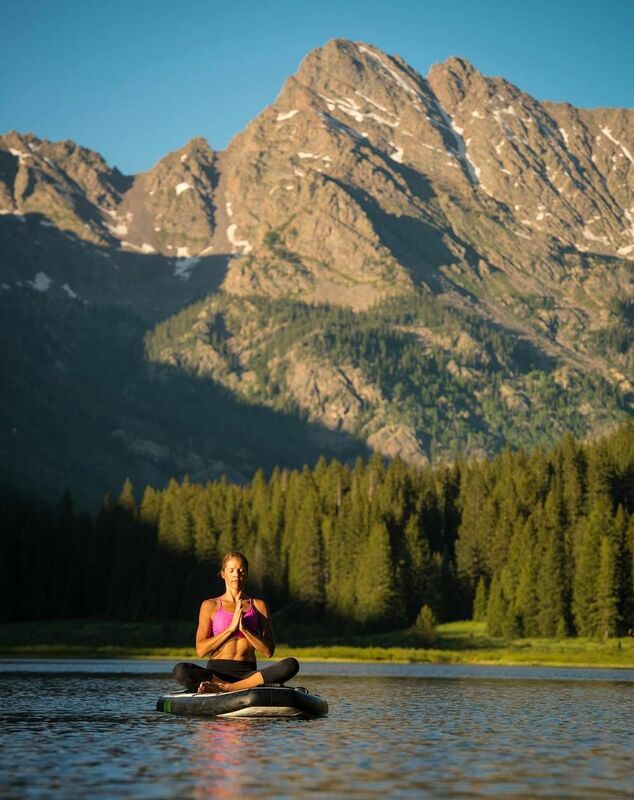 The Piney River Ranch rents canoes, stand up paddleboards and offers other adventures for your afternoon of high-alpine fun. Blue alpine lakes and views of Flattop Mountain, Ute Pass and the Continental Divide stand out as highlights of this hike. At nearly 10 miles, with significant elevation gain, this is a difficult hike, but well worth the sweat. The first destination is Gold Creek Lake, roughly 2.8 miles in, and surrounded by pine forest. In 1997 the area suffered through the Routte Divide Blowdown, in which winds reaching 120 mph whipped through the valley, blowing down around 4 million trees in a swath of land 5 miles long and 30 miles wide. The freak storm is regarded as the biggest blowdown in history within the Rocky Mountains. Other highlights of this hike include Ute Pass, a huge open meadow worthy of an afternoon in a hammock with a book and some snacks. Gilpin Lake lies further on after a strenuous climb to the top of Gilpin Ridge. The lake stands out as a blue gem at the bottom of a jagged bowl of mountains. This short, 1.8-mile hike leads to the tallest free-falling waterfall in Colorado at 365 feet. Standing above the falls is the second oldest AC generator plant in the country, built in 1907 to supply power to the Smugglers Union Mine. 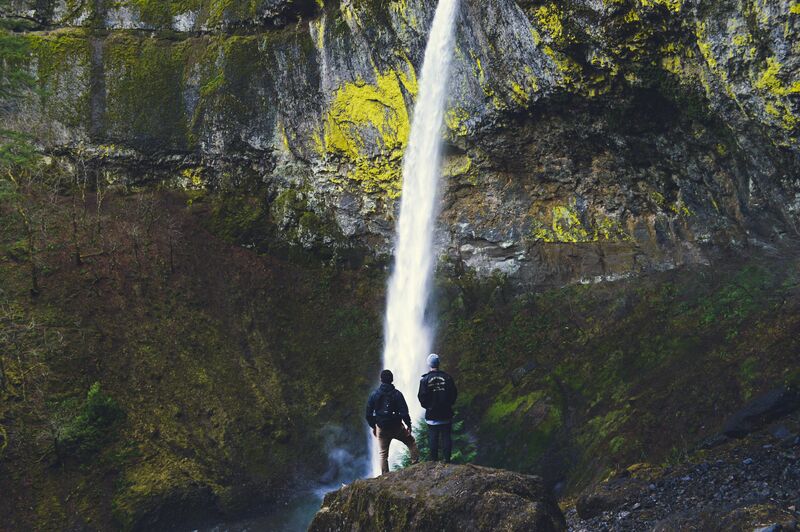 The trail leads to a stunning viewpoint at the base of the falls, which is usually enveloped in mist. From the viewpoint, you can hike the remaining 0.8 miles to the top of the falls, and enjoy open views of the power plant as you hike. Equally stunning as it is haunting, Red Mountain Pass connecting Ouray to Silverton and Purgatory Resort, is historical and deadly. Deep crevasses and near vertical cliffs hanging from the highway edges (which don’t boast guardrails due to winter snow removal) mean you might be white-knuckling it during sections of the drive. In fact, USA Today ranked Red Mountain Pass one of the 12 deadliest roads in the world. 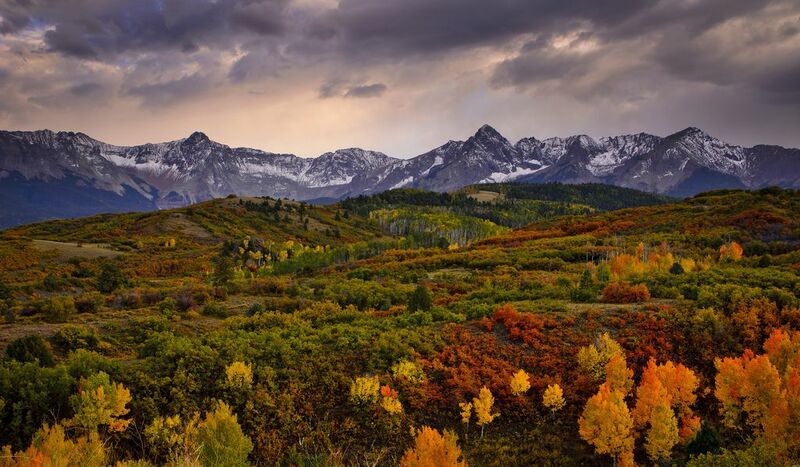 But the rust-colored mountains, jagged peaks, and brilliance of the aspen groves in the fall make this drive well worth it. You’ll pass by long deserted mining towns, the gloomy windows and paint-chipped buildings showing a difficult life amongst the staggering beauty. Mountains rise straight up from the valley floor, towering overhead like rusted steel and amber monoliths. This arduous 8-mile hike leads you to 10,000-foot- high Snowmass lake, sitting above the tree line and surrounded by the jagged frame of Snowmass Peak, which reaches just below 14,000 feet. 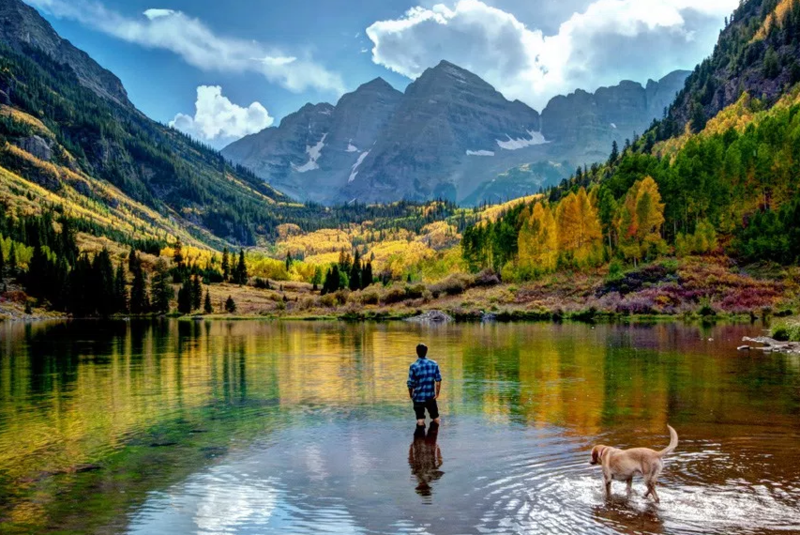 This hike is within the Maroon Bells-Snowmass Wilderness area and is a popular trail during summer months, due to its undulating wildflower filled meadows, claw-like peaks and stunning vistas. You’ll hike among giants on this incredible trail, so don’t forget the camera. Lone Eagle Peak is a stunning spire jutting at an elevation of 11,900 feet. At its base is Mirror Lake, which lives up to its name, reflecting the pine trees that surround it and the needle-point of Lone Eagle Peak. This hike is not an easy one, but once accomplished offers hikers one of the most sublime views Colorado has to offer. Do the hike as a hefty day hike, or spend some time below the commanding peak with an overnight backpacking trip.